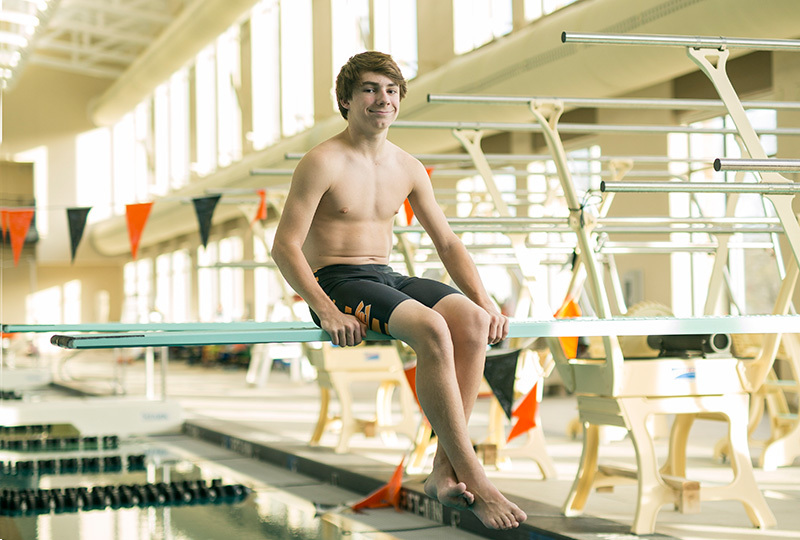 A bubble of cerebrospinal fluid growing within Clark Akers’ spinal cord had the potential to leave him paralyzed and rob him of a passion for competitive diving and golf. Consistent, severe headaches and occasional vomiting prompted the then 12-year-old to have an MRI in June 2015. The doctor who read the MRI results made a surprising discovery, Clark had a Chiari I malformation, typically a congenital issue in which the bottom part of the cerebellum drops down into the base of the skull. The malformation often disrupts the normal flow of cerebrospinal fluid between the spinal column and the brain. The pressure changes caused by the disruption can force the fluid into the spinal compartment, causing the potential for paralysis. This bubble of cerebrospinal fluid, which doctors saw around Clark’s spinal cord, is called a syrinx. Clark and his parents, Elizabeth and T. Clark Akers, sought to understand the severity of an unfamiliar diagnosis and to seek treatment options. After gathering information, they knew resoundingly the Chiari malformation needed to be addressed by a pediatric neurosurgeon. With summer break almost half over, the Akers, who live in Nashville, dove into the challenge of finding the best pediatric neurosurgery team. North, South, East or West—they were willing to travel the world for Clark’s health. After a half-dozen consultations and visits with top pediatric neurosurgeons across the country, the Akers landed in their own backyard for the care they desired—Monroe Carell Jr. Children’s Hospital at Vanderbilt. When a child is sick or chronically ill, parents want answers, the best quality health care, the most qualified medical professionals and an institution that will care for the whole family. Finding those characteristics in pediatric health care isn’t always a simple drive to the nearest local hospital or provider. But there is a resource for families like the Akers to help them identify hospitals across the nation that are the most qualified hospitals to provide comprehensive, specialized medical care for children: U.S. News & World Report’s annual Best Children’s Hospital rankings. While the rankings have evolved since its inception nearly a decade ago, the report, a Good Housekeeping Seal of approval of sorts, identifies the top pediatric specialty programs across the country. For the 10 years since the Best Children’s Hospital report began, Monroe Carell Jr. Children’s Hospital at Vanderbilt has received the honor of being named among the nation’s leaders in pediatric health care every year. In the 2016-2017 report, Children’s Hospital achieved a maximum of 10 out of 10 nationally ranked pediatric specialty programs, and continues to be the only pediatric hospital in Tennessee to receive this distinction. “Our tremendous successes are a direct correlation of the quality of care that we, as a team and as an organization, strive to deliver to our patients and families on a daily basis. No one person can do this alone,” said John W. Brock III, M.D., surgeon-in-chief of Children’s Hospital, director of the Division of Pediatric Urology, Monroe Carell Jr. Professor and Senior Vice President of Pediatric Surgical Services. Brock, whose Pediatric Urology Division is ranked in the No. 4 spot in the nation, serves as part of an executive committee focused on quality improvement initiatives across the Children’s Hospital organization, engaging every employee to be involved to ensure the best, comprehensive care is provided for all patients. Also leading the charge at Children’s Hospital are: Lauran Sevier, quality improvement analyst; Autumne Bailey, MSN, RN, PCNS-BC, administrative director of Performance, Management and Improvement; Barron Patterson, M.D., associate professor of Pediatrics and medical director for Outpatient Quality and Patient Safety; Jim Hollender, Chief Operating Officer; and Pradeep Mummidi, data analyst. Each year, Children’s Hospital has seen its rankings continue to climb. Urology has remained a constant leader in specialized urologic care for children. The division has consistently ranked in the top 10 since U.S. News & World Report began ranking the pediatric urology specialty in 2009. Among the other pediatric specialties, six others moved up in the rankings. Cancer improved from 30th to 18th; Gastroenterology & GI Surgery moved up from 32nd to 22nd; Nephrology improved from 42nd to 30th; Neurology & Neurosurgery moved from 15th to 12th; Cardiology & Heart Surgery went from 20th to 19th; and Neonatology moved up from 27th to 26th. Other specialties ranked this year: Orthopaedics (14); Pulmonology (17); Diabetes & Endocrinology (31). The 2016-2017 Best Children’s Hospital report ranked the top 50 pediatric centers in 10 medical specialties. Scores are calculated using clinical operational data related to the level and quality of hospital resources, delivery of health care, best practices and clinical outcomes, as well as results from a reputational survey of board-certified pediatric specialists. Seventy-eight of the 183 surveyed hospitals were ranked in one or more specialties. Surveys reflect a full calendar year’s worth of work and data collection for each hospital, and includes more than 1,000 questions, which focus on much more than the 10 specialties ranked. While certain questions are dedicated to each pediatric specialty, weight also is given to the quality of well-rounded care at the whole hospital, including family engagement, school services, technology, staffing, infection rates, language interpretive services, among myriad other data measures. The framework for how U.S. News evaluates hospitals focuses on three areas: outcomes (includes survival, infection rates, quality of life); process (how well and efficiently a hospital goes about the day-to-day business of delivering care); and structure (reflects on a hospital’s available resources in providing care for patients). “It’s important to know that these rankings are based on data and true outcomes we have for patients, and parents can come to Children’s Hospital knowing their children are going to get among the very best care in the nation,” Autumne Bailey said. The Pediatric Neurology/Neurosurgery team has been climbing the rankings in recent years, and is now ranked 12th in the nation. The Akers made it a family affair in their search for a pediatric neurosurgeon. They wanted Clark to be a part of the decision-making process, as he needed to be comfortable with the team who would operate on his brain for about three hours. Clark previously had surgery at Children’s Hospital to remove his appendix when he was in fifth grade, so he was familiar with the hospital and with the excellent care he received during that procedure. “I had a lot of confidence in Children’s Hospital because I had been there before,” said Clark, now 14. In addition to the reputation and proven results of the pediatric neurosurgery team, the Akers were impressed with Wellons and the team’s initiative to involve Clark right off the bat, without being asked. Clark had his surgery on July 31, 2015. During his six-month recovery, Clark had to avoid athletics, including diving. He also had to suspend his golfing and any heavy lifting, difficult for a teen who also camps as part of the Boy Scouts. He is currently a Life Scout, Scouting’s second highest rank. In spring 2016, he got the news he had been waiting for. The bubble of fluid, the syrinx, was gone. The operation had been a success. All Clark’s restrictions were lifted. Each year, when the rankings and scores are released in the spring, the Children’s Hospital quality improvement team members share the results with hospital leaders and each specialty division chief. They analyze the data on what divisions did well and explore where there is room for improvement to close any gaps to make Children’s Hospital a place where families like the Akers choose for their child to receive care. A prime example: The Pediatric Hematology/Oncology program working with the Pediatric Emergency Department, in a gap analysis of the data, saw room for improvement in care provided to children battling pediatric cancers. The program, which has continued to see gains in the rankings over the last few years, landed in the No. 18 spot for 2016-2017 rankings. They examined treatment and care options for children who have cancer and are undergoing chemotherapy and who present to the emergency department with a fever. Because patients in the middle of a chemotherapy regimen have lowered blood counts, and therefore lowered ability to fight infection, best practice is to administer antibiotics in the first 60 minutes of being seen in the ED to help fight a possible infection. They are then admitted for almost 72 hours to make sure they don’t have a blood infection, UTI, lung infection or other concerns. The Code Yellow Team, which has been recognized for their work, is a cross-discipline, cross-departmental team of members from Pediatric Hematology/Oncology and Pediatric Emergency Medicine. Their goal: to improve care to this population of pediatric cancer patients by increasing the number of patients who received antibiotics within 60 minutes. Their antibiotic administration rose to and has been sustained at 92 percent. About two years ago, Children’s Hospital launched an effort to follow quality and care improvement data on a more granular level. Data analyst Pradeep Mummidi built a computer dashboard that looks at real time numbers and provides a snapshot to the different pediatric specialties. Division chiefs can pull the dashboard to view information on benchmarks such as readmission rates, follow-up care, returns to the operating rooms and see where they can make improvements in care for children. Children’s Hospital is continuing to build on the successes and achievements of staff to provide quality comprehensive care. That includes the hospital’s forthcoming four-floor addition atop the existing hospital structure. But it’s the staff making a difference and investing in the care of patients that shows why families should come to Nashville. The full 2016-2017 rankings, which include information on infection rates, adequacy of staff, procedure volumes and more from the 183 hospitals, are available on the U.S. News website, health.usnews.com/best-hospitals/pediatric-rankings.